I was on an Easyjet flight (I think an A320), when mid-flight, I overheard a member of cabin crew tell another passenger there was a 'technical' issue with the aircraft, that might make us slightly behind schedule. Naturally, I imposed on their conversation to basically ask her to repeat the issue to me in detail. She said that the 'mechanism' that transfers fuel between the two tanks had failed, and so only one tank was available. Obviously, the flight completed without any noticeable events, but could someone explain to me what happened as I do not understand. The "mechanism that transfers fuel between the two tanks" is a valve, called crossfeed (x-feed) valve. If it failed open, then the crew would have kept an eye on the left/right tanks to make sure they are balanced. If for example the left tank became heavier, they can switch off the left pumps until they are balanced. If an engine failed with the x-feed valve failed closed (shown above), the other working engine will draw fuel from only one side, causing a relatively rapid imbalance. The crew will then land ASAP. And label (6) here is the x-feed valve, it's the only thing connecting both sides. That's why there are two valve motors for redundancy. The conversation may have been about fuel pumps or fuel transfer valves but the flight attendant was probably told that as a simple explanation - it would not have been the real cause. Aircraft have multiple systems to pump fuel, transfer, and pipe it so no single failure will affect normal operation. 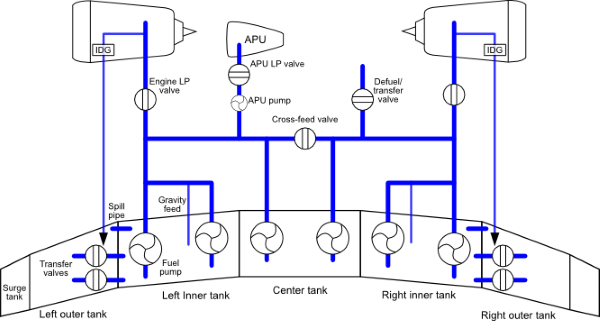 For example, pumps have automatic bypass valves so that other pumps will continue the normal flow past the failed pump. No single transfer valve obstructs fuel flow. There are multiple paths to get the fuel to the engines; either directly or by transferring through a completely different set of pipes to another tank then on to the engines. What likely happened was there was one or more FILTERS that became obstructed. Both ice particles and algae often obstruct filters. But once again all the filters have automatic emergency bypass valves and pipes. However, it is not unheard of for polluted jet fuel containing large amounts of algae to overwhelm the filters. If the filters and/or bypasses either obstructed engine filters, made one or more tanks unusable, or reduced the fuel flow, the Captain would have chosen an altitude and speed that gave best fuel economy; and would have arrived late. It is worth noting that algae contamination is quite severe in some parts of the world such as Asia and Pacific Island nations. It is common practice for American airliners to carry more fuel than necessary when headed abroad to help "dilute" the bad fuel in other parts of the world. 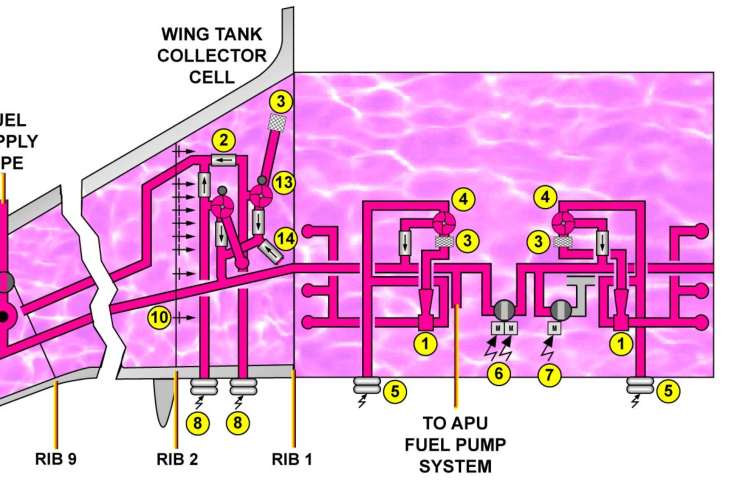 Simplified Airbus diagram of a typical fuel system showing multiple pumps, transfer valves, and paths to each engine. 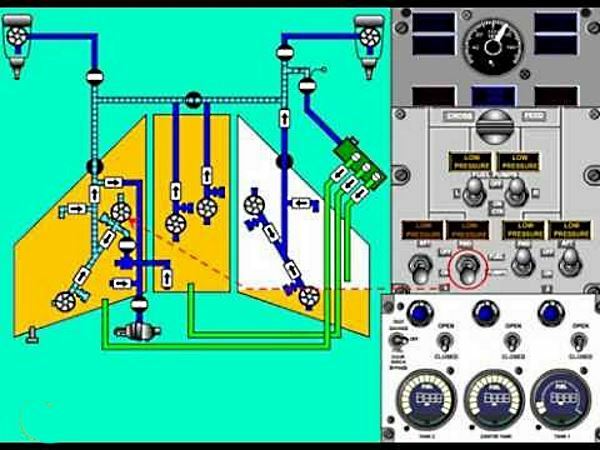 B737 diagram (one of the simplest airliners) showing multiple pumps, transfer valves, and paths to each engine. The usage and movement of fuel changes the aircraft's center of mass. A lot of aircraft have fuel pumps that move fuel between the two tanks in the wings to make sure one side does not get heavier than the other due to unequal usage of fuel by the engines and thereby, helps in balancing the aircraft while in flight. It makes the pilot's job a lot easier. If there really was only one tank of fuel available on an aircraft that typically has two tanks filled, that would at a minimum mean that the airplane would have to fly on half the fuel that was intended to be available for the rest of the flight. If such a failure happened mid-flight, as in your claim in the question, it'd mean the pilots suddenly had only 25% (of what they took off with) usable fuel, when they intended to have 50% at that point in the flight, having taken off with 100% and expecting to land at near empty. In such a case, unless you were very near the destination anyway (in which case delay would be insignificant, so no real need to tell anyone in the cabin), to not divert to the nearest suitable landing site would be irresponsible on the part of the pilots. Since you say that the flight completed without any noticable events, it stands to reason that the flight indeed did not divert. The only reasonable exception to the decision to not divert after half the remaining fuel becomes inaccessible mid-flight would be if the pilots took off with at least 1.5 times the fuel they needed for the flight. Let's say that the flight required 100,000 kg of fuel, plus applicable reserves. Normally, half-way through the flight the aircraft would be down to half that, or 50,000 kg plus reserves, distributed evenly between the tanks. Assuming two tanks, that's 25,000 kg plus half a reserve, per tank. If only one tank is available, but 50,000 kg plus reserves is available, there must then be no less than 100,000 kg on board (50,000 kg of which now unusable) after burning through the fuel needed for the first half of the trip (corresponding to 50,000 kg of fuel). Therefore, the aircraft would have had to take off with 150,000 kg of fuel plus reserves, 1.5x of the required 100,000 kg plus reserves, to still be able to make it to the intended destination with the same amount of fuel remaining as intended if half the remaining fuel becomes unusable at the mid-point of the flight. Since hauling fuel around itself requires fuel (because the aircraft is heavier), pilots don't load up amounts of fuel above and beyond what they need, without very good reason. Assuming that the aircraft was topped off with an appropriate amount of fuel before take-off, the pilots would suddenly be faced with having at most half the remaining range intended; likely less, because you don't run the tank all the way down to empty, especially when the other wing is weighed down by at least 50,000 kg of fuel. Therefore, I conclude that there must have been something going on beyond what you describe in your question. There may have been an issue, and it may have had something to do with the amount of fuel available to the engines, but it seems highly unlikely to have been the sudden inability to use half of the fuel remaining onboard. Not the answer you're looking for? Browse other questions tagged airbus-a320 fuel-tanks fuel-systems aircraft-failure or ask your own question. How the fuel in the wings is managed in case of an engine failure? What is the role of baffles in Fuel Tanks? Would it have been feasible to install 'conformal fuel tanks' on the Mercure?